From pasta to poultry to potatoes, practically every food can be cooked through steaming, which is also an excellent way to conserve water in the kitchen. Steaming food preserves a generous amount of water compared to boiling, typically using more than 50 percent less water while still serving as a healthy method of preparing a meal. 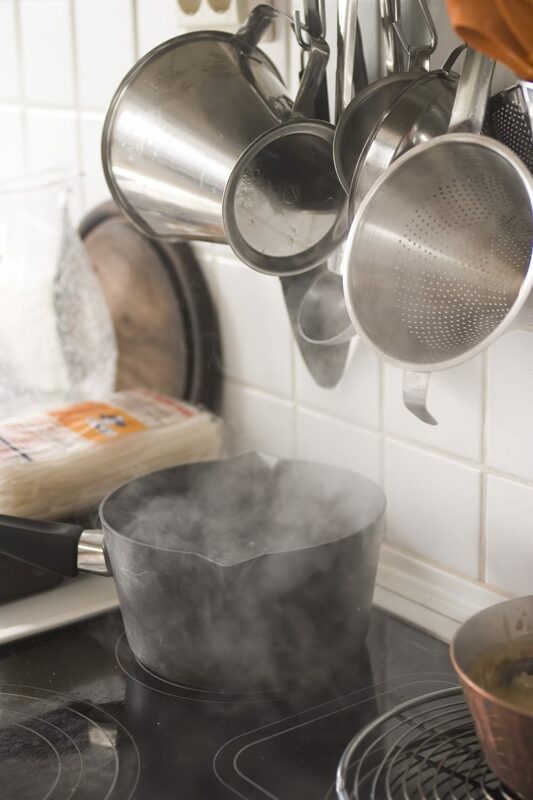 Steaming is also able to preserve more nutrients than boiling, especially with vegetables because the food is not completely submerged in heated water which tends to evaporate the majority of the nutritional content. Sometimes preparing a full course dinner for the family requires an abundance of pots and pans. Instead of having every food item dedicated to a specific kitchen appliance, cook two foods with one pot instead. If you are boiling pasta, wait until there are only a few minutes left on the timer and add the veggies you are using, which generally only take two to three minutes to cook anyway. You will be amazed at how using this food preparation strategy can gradually reduce the amount of water you use to cook over time. Typically the directions for cooking food tend to lean on the generous side of measurements when it comes to water portions. The truth is that you don’t necessarily always need the amount of water called for on the packaging instructions, and skipping out on a few ounces or cups of water with every entree starts to add up in the long run. People are prone to go overboard when it comes to how much water they use to clean their dishes. First off, continuing to run water while soaping down and scrubbing off food debris is a classic wasting offense. Simply plugging up your sink, making a little bath for your dishes and only use the amount of water you have provided for yourself will easily save gallons every time you have to clean. Also, what is the point of sending a plate or bowl through the dishwasher if you have already rinsed and cleaned it out in the sink? Try to stick to one or the other and odds are you will be doing yourself a favor when it comes to your water bill. This entry was posted in Health Tips, Studies & References. Bookmark the permalink.